Italy is a country renown for high fashion, and also immense historic beauty. Also here, are many lesser known treasures, waiting to be rediscovered by modern day explorers. On our last trip to Tuscany, Italy, we did the mandatory discount shopping for fancy ladies fashion accessories and shoes at the Prada outlet, but of course! Who goes to Tuscany and doesn't shop? For some, finding deals for such top notch genuinely high quality lifestyle gear at (sometimes) over 50% off retail is almost like, Indiana Jones finding the Lost Ark; well, for some others, it like finding the Temple of Doom, LOL. 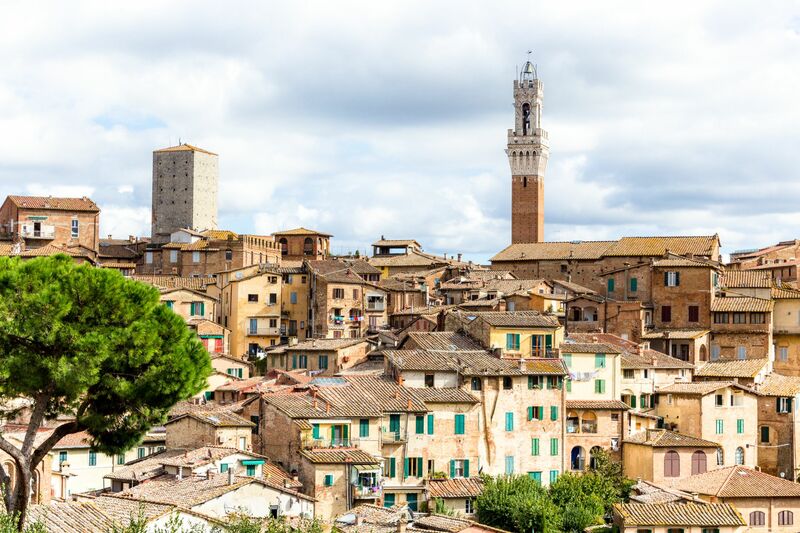 After emptying out our wallets at the ultra-modern retail warehouse, we drove by the unassuming neighbouring hill town of Siena. Seeing the reddish brick buildings of this medieval city was very refreshing. This quaint old city has a slower pace from bustling touristy Florence. A nice welcome to our party of four. After some cheap piazza from the square, we wandered along the town's meandering and crisscrossing streets. Three storey brick buildings, which all looked the same to us, laced the streets and seem to go on forever. With no map nor GPS then, I felt like a mouse in a maze looking for cheese. 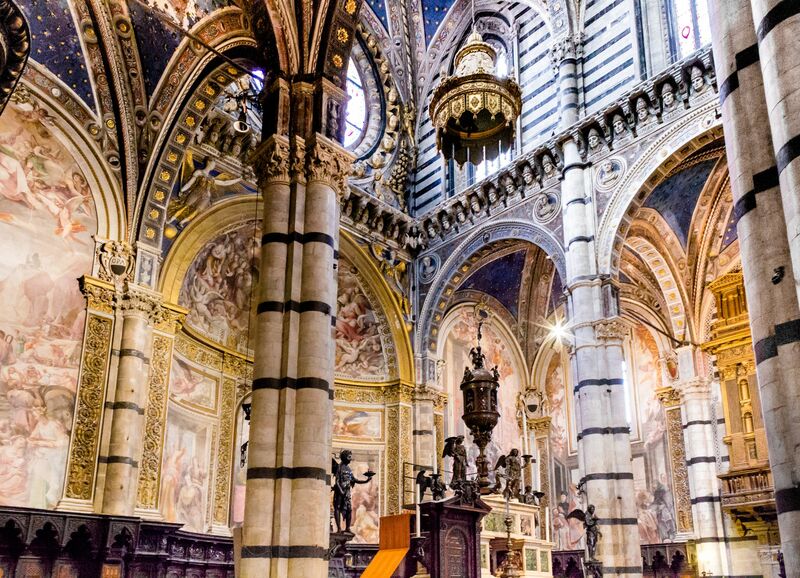 And then, just around some corner, there stood before us the white walls and black stripes of the towering Cattedrale Metropolitana di Santa Maria Assunta - best known as, the Siena Cathedral. It looked a like nice enough Roman Catholic cathedral or duomo (as they call such in Italy). Plenty of gorgeous intricate sculptures and detailing, but smaller than the "gianormous" one in nearby Florence. After reading about how one should definitely enter this building .. I bought tickets, and headed straight for the entryway. Inside, we found ourselves at the start of a long, dark and large interior corridor. Tall black and white striped pillars line both sides of this central passageway. These pillars go straight up high, where rows of heads of religious people are looking down on us. There are statues and sculptures all around. There is intricate artwork detailing on the walls and on the marble floors. It didn't take long for me to locate in the flooring, the Wheel of Fortune and the Sienese Wolf (1373), who is surrounded by Symbols of the Allied Cities. It took quite a number of artists, including the famous names, to create this place. Proceeding down the main corridor, we start to see the main altar. But, before that, one can't help but be amazed by the marble pulpit carved by Nicola Pisano. 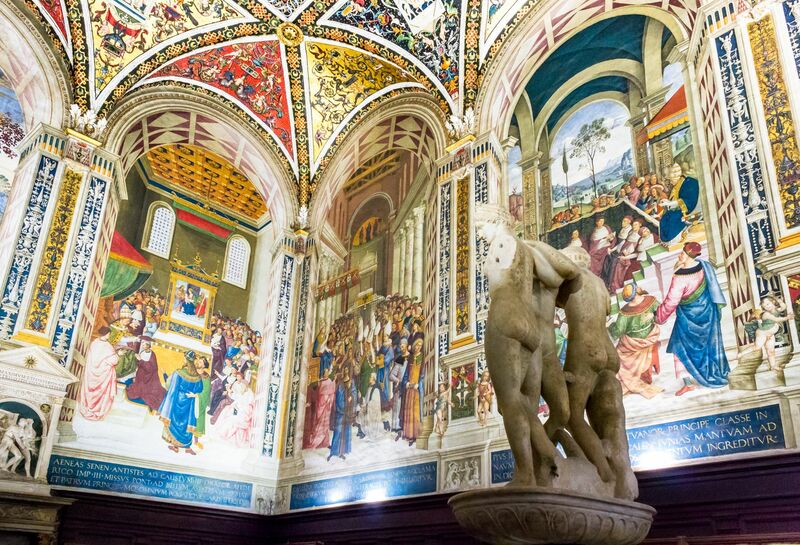 To the side of the Cathedral, we pass through a small opening and enter into the Piccolomini Library. As if the church itself was not incredible enough, this room is a little mind blowing. It's the painted frescoes. Their vivid colours and strikingly good three dimensional effects from the 1500's are really quite enjoyable to look at. I look up at the ceiling and ask myself, what is this place doing here hidden in the midst of an old rusty looking brick town, inside the town's central church? I pause for a bit. To appreciate and soak in the view of these beautiful sacred creations, quietly hoping to catch a little of the divine artistic inspiration that happened here. I'm almost certain that some top Italian fashion designers still secretly do this too. 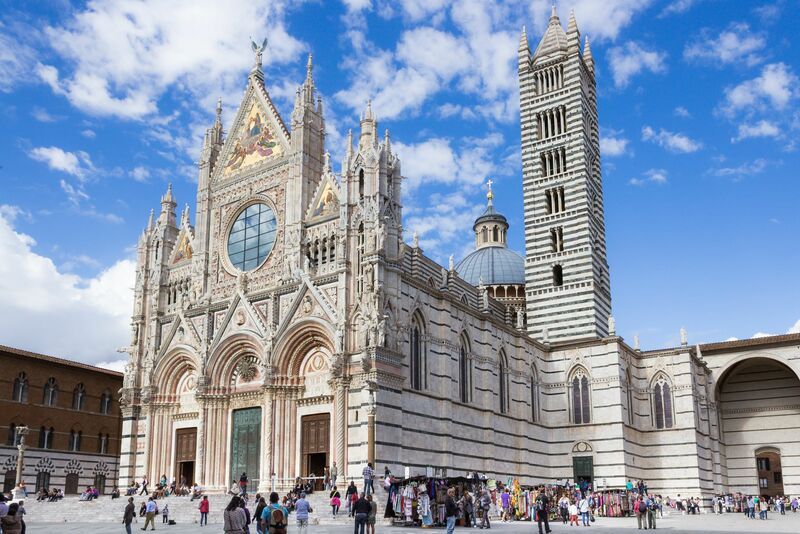 The next time you do some serious shopping in Italy, you might just feel the need to visit an awesome historic cathedral like we did. Perhaps the divine graces present will help get you over the remorse of over-spending on life's indulgences; or have you leave, glowing inside with a next level of inspiration.